A common and easy to identify family of mushrooms, the Boletus family is a large genus of mushrooms which until recently was split into a few smaller families, the main three being; Boletus, Leccinum, and Suillus. 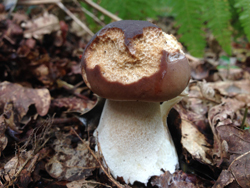 With the genome of mushrooms now being sequenced the family has been split much more with the scientific names changing regularly, this can lead to confusion with identification so for the purposes of foraging we consider any mushroom with a stem and pores instead of gills a Bolete. Almost all members of the larger Boletaceae family have pores or tubes instead of gills which make them an easy family to identify. 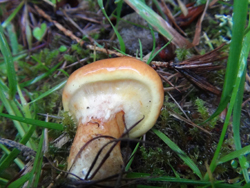 Boletales also contain some mushrooms without tube-like pores like the Paxillus, Hygrophoropsis and Scleroderma families but this article is about Boletes with tube-like pores instead of gills or internal spores. Boletes are usually large fleshy mushrooms that come in a variety of colours with a thick or bulbous stem and no ring, except for some of the Suillus. The stem often has a network of dark lines or spots. The pores under the cap can be white, cream, yellow, orange or red and are normally easy to remove from the cap. There are about two hundred and fifty Boletes worldwide with about eighty identified in the UK which, with only a handful to avoid due to toxicity, leaves a good amount of edible mushrooms that can be safely identified for consumption. 1. Make sure you have a Bolete, an upright mushroom with a stem and with sponge like pores instead of gills under the cap and growing in soil, not on wood. 2. If there is any red colouring on the mushroom, that includes the stem, pores or cap, avoid as this can be the sign of a toxic Bolete. 3. Slice the mushroom in half vertically, if the flesh turns vivid blue quickly after or immediately on cutting, again avoid due to possible toxicity. 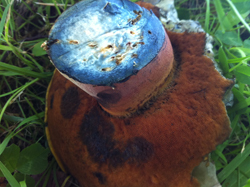 The pores on a few edible Boletes can discolour to green or blue but it is the flesh changing colour rapidly that is a sign to avoid the mushroom. 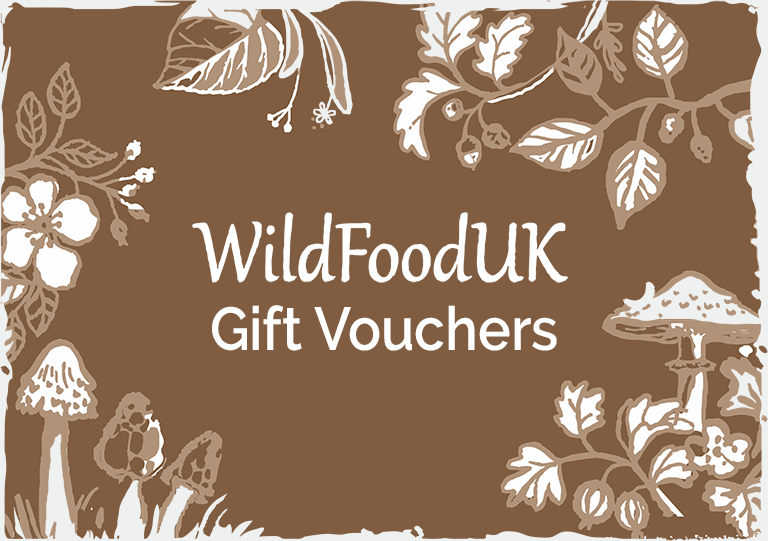 Keeping to the above rules will keep you safe when foraging for Boletes; this does mean that you are missing out on some of the good edible ones but more importantly, avoiding the toxic mushrooms. With a little experience you will get used to identifying this family and as it becomes easier to distinguish between them you will be able to safely identify some of the edibles that don’t stick to the above rules. 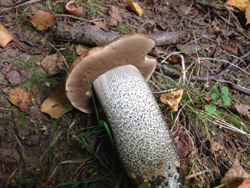 There is one mushroom that will pass the above rules of edibility that I don’t recommend eating; it’s not toxic in any way but will ruin any dish it gets into: the Bitter Bolete, Tylopilus felleus. It is one of the most bitter things I have ever tried, the bitter taste lasted for most of the day. It looks quite like the Penny Bun, Boletus edulis, but a small nibble of the mushroom will soon let you know if it is a Cep or Bitter Bolete or if you are a bit worried about nibbling unknown mushrooms the Cep’s stem has a white network of lines on a slightly darker background; the Bitter Bolete has a darker network of lines on a lighter background. 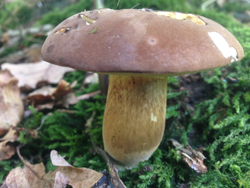 The Cep, Porcini, Penny Bun or King Bolete, Boletus edulis is considered one of the best edible mushrooms, hence the many names and high prices it commands but other Boletes like the Bay Bolete, Boletus badius, the Dark Bolete, Boletus aereus, or the Orange Birch Bolete, Leccinum versipelle, in my mind are every bit as good, just not as well known. Leccinums generally have less bulbous, white/off-white stems that are covered in woolly black scales giving them a dirty appearance. 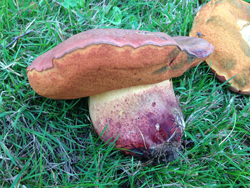 The Orange Birch Bolete, Leccinum versipelle, is one of the most nutritious fungi growing in the UK with proteins, carbohydrates and fats at a higher level to most other mushrooms, they also contain many minerals and vitamin A and some of the B vitamins. Leccinums should all be well cooked before consumption, a minimum of ten minutes being the often quoted guideline. Suillus mainly have glutinous caps, some have rings on the stem and they all grow in association with conifers. 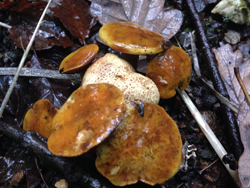 One of the most common and easily identified Suillus is the Slippery Jack, Suillus luteus, it has a ring on the stem and a slimy cap. It is an okay edible mushroom once the slime has been removed but improves in flavour if the pores are also removed and the mushroom sliced and dried. Another very common Suillus is the Larch Bolete, Suillus grevillei, which is odd in that when young it has a white woolly veil or fine cobweb-like mesh covering the pores, a little like a Cortinarius (The Webcap Family of mushrooms). It is best to remove the slimy top and soft pores of Suillus mushrooms as they can cause minor gastric upsets in some people. Nearly all members of the Boletaceae family have mycorrhizal relationships with trees and can be found under and around both broadleaf and coniferous trees with a few exceptions like the Parasitic Bolete, Boletus parasiticus, which grows from the Common Earth ball, Scleroderma citrinum, which makes this particular Bolete quite unique. Some people remove the pores when they find Boletes and spread them about the surrounding area, this will leave behind some spores in the right environment to have a chance of growing into a new mushroom and I will do this with some of the Boletes I find as the pores can become slimy when cooked, but mushrooms like the Penny Bun or Dark Bolete are too good to throw any part of them away and I will eat these mushrooms pores, stem and any maggots included (within reason)! Most of the Boletes are loved by maggots as well as us humans so I have learnt to share by leaving behind the really maggot-eaten mushrooms and ignoring the odd few maggots in good specimens, they were born in the mushroom and have only ever eaten mushroom, they taste of mushroom and I’m not prepared to leave behind all the mushrooms I find with maggots in as I would soon end up very hungry indeed. 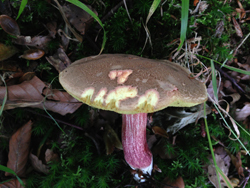 That said the Bay Bolete, Boletus badius, seems not to attract too many flies and can usually be found maggot free.